Once I had seen the old fashioned air speed indicators, it did not take me long to find references to an even older idea: the hydrometric pendulum. (mentioned in books as old as 1884) So a simple pendulum (or float!) would indeed work if I was able to measure the angle of deflection. I scribbled a few doodles down on a piece of paper, and ran in to my wife’s office at Northwestern University to discuss it with her. At the time, she was conducting a lab session with her instrumentation students, so they also got an earful of my enthusiasm, which amused everyone. As you can see from the picture I figured I was going to need a really big battery in a heavy enclosure resting on the floor of the cave, so I initially conceived of the device using a float rather than a pendulum. I was still trying to figure out some way to actually measure the angle of deflection without breaking the integrity of the underwater housing because I knew each gasket or o-ring was just another potential point of failure. I had some idea of just attaching the bobber to a joystick mechanism, and one friend suggested putting magnets on the string and using hall effect sensors in the case. But I was still trying to figure out how it might be possible to put everything, including the sensors, inside the float itself. 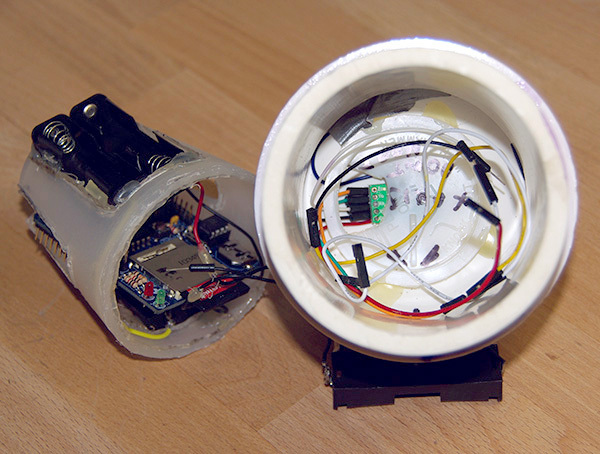 I soon discovered from the Arduino forums I was rummaging through that there were plenty of people using accelerometers in tilt sensing applications very much like this, for robots, quad copters, and even one fellow who put a datalogger with an accelerometer on his garbage can. So I set to work building prototype data logger / accelerometer combination, bootstrapping myself on the arduino micro-controllers with the many helpful tutorials at Adafruit Industries , and of course the Arduino playground. I was, and still am, beholding to the many people who share their expertise so freely in the open source hardware community. And I managed to cobble together a couple of dry prototypes (that actually recorded data) near the end of 2011, which I dragged around at Christmas of that year, doing show & tell sessions with my more technically able friends. My wife, bless her, put up with “Ed’s latest project” evangelism, even though I had melted my way through most of the drinking cups in the kitchen, and the house was beginning to take on the distinct bouquet of poor soldering & burnt plastic. At the time I was using a vanilla Arduino Uno, with an Adafruit data logger shield. To that I had added the MMA7361 from modern devices as the accelerometer, and the whole thing gave me a whopping 24 hours of run time out of 6 AA batteries. Not exactly the year’s worth of data we were hoping for but I had managed to cram all of that into a hunk of pvc pipe from Home Depot, so the “all in the float” approach was looking like it might just be possible. I still had not given anything a “dunk” test yet, but at least it was a start. This entry was posted in How this project started... on February 3, 2014 by edmallon.